Lambeosaurus was a large herbivore (plant-eater) normally about 30 feet (9.1 meters) long, although a specimen has been found that was 54 feet (16.5 meters) long. Lambeosaurus lived in North America during the Cretaceous period, about 83 to 65 million years ago, It was one of the dinosaurs that died out in the Cretaceous-Tertiary extinction, 65 million years ago. Lambeosaurus had two structures on its head: a hollow crest which pointed forward, and a solid bony spike which pointed backward. Like Corythosaurus, Lambeosaurus was a duck-billed dinosaur, and was a good runner that probably lived in herds. North American Dinosaurs - Lambeosaurus lived in North America. Lambeosaurus was a genus of dinosaur. "Lambeosaurus" means "Lambe's lizard". The name was chosen in 1923 by William Parks, and is in honor of Lawrence Lambe who had previously studied the animal. Lambeosaurus was a member of the Ornithischia ("bird-hipped") order of dinosaurs. What this means, is that although Lambeosaurus was not closely related to birds, it did have similarly shaped pelvic bones. Lambeosaurus was a Hadrosaur (usually known as "duck-billed dinosaur") - a member of a group of related herbivorous (plant-eating) dinosaurs that were very successful in the Cretaceous period. Lambeosaurus lived between about 83 million years ago and 65 million years ago, during the late Cretaceous period. Lambeosaurus was one of the dinosaurs which died out during the Cretaceous-Tertiary mass extinction at the end of the Mesozoic Era. 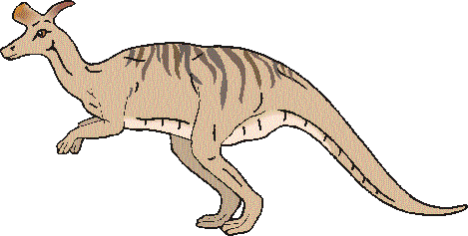 Lambeosaurus was a herbivore (plant-eater). Lambeosaurus was typically about 30 feet (9.1 meters) long, but animals as large as 54 feet (16.5 meters) long have been found. Lambeosaurus weighed about 5 tons.